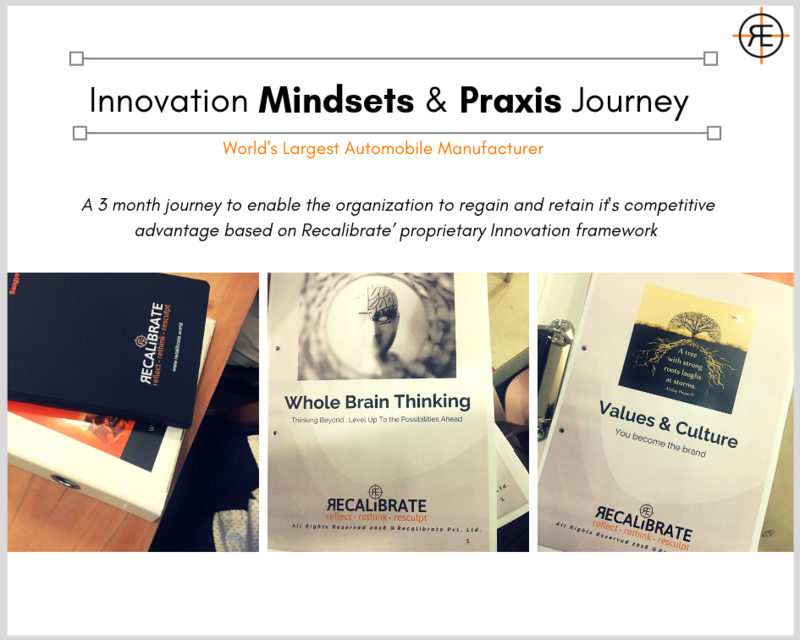 In August 2018, Recalibrate’s innovation mentoring team led by Dr. 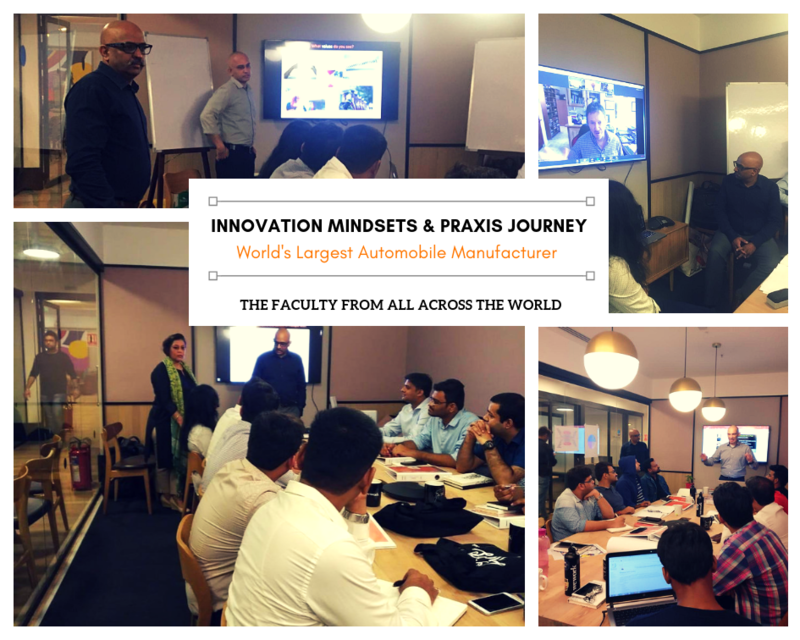 Deep Bali and Eli Itin began working with one of the world’s largest automobile manufacturers, taking a cohort of 11 shortlisted members on a 12-week innovation journey aimed at helping it gain competitive advantage and sustain its strong market share. 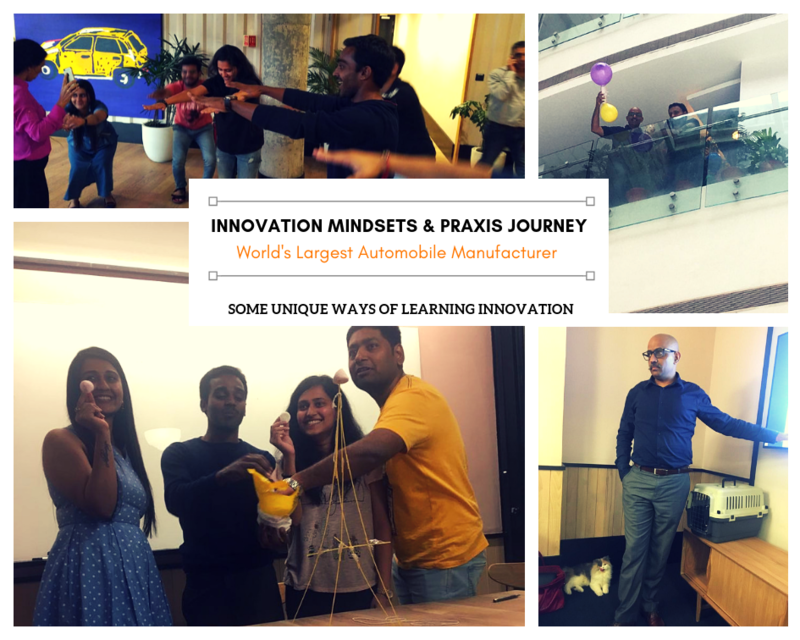 Our client organization had been looking to double down on its innovation capability and capacity to incubate two identified challenges that can potentially disrupt the automobile industry, by setting up an incubation lab and accelerator for bringing cutting edge solutions to enhance their market share and customer experience. We were awarded the contract based on two primary attributes we brought to the table: our proprietary innovation model designed by Dr.Deep Bali, Lavindra de Silva and Eli Itin, which comprises of mindsets, horizon, praxis & spaces and our team’s combined experience as practitioners, thinkers and academicians. The client minced no words in sharing that they couldn’t find any player in the market with such a strong holistic model that talks of mindsets even before getting into ideation and praxis. Skunkworks like scenario: About half of the 11-people strong cohort is from out-location and staying in Gurgaon for this project for six months. They moved after wrapping up previous assignments and some even got the opportunity to do some preliminary research as a warm up warming up for this voyage. Some members’ family had also joined their respective spouses and both the teams are also staying together in shared accommodation to double productivity and work long hours. Neethling Brain Instrument (NBI) – This assessment is based on the Whole Brain Thinking method founded by Dr. Kobus Neethling , who is also partnering with us on this journey. EntreCode Instrument – This instrument assesses entrepreneurial potential, an important consideration for the organisation as it wanted to quickly move into incubation any prototype that came through the innovative and breakthrough ideas on the two planned challenges. The cohort was later debriefed individually as well as a group starting with NBI, which highlighted an individual’s thinking styles and the preferred way the individual wanted to think – which proved to be an eye opener for the cohort. The whole brain technique was utilised for creativity and decision making resulting in the first breakthrough for the group. The kick off: The first day was marked by tremendous excitement and a sense of taking on an important responsibility. The chairman of the organization addressed the cohort and the top leadership of the client organization, sharing his vision behind starting the accelerator followed by perspectives from several guest speakers. Recalibrate introduced its lead faculty including Dr. Deep Bali, India and Eli Itin from Australia, supported by Puja Puja and Vishal Chopra (India). Dr. Kobus Neethling, the globally acclaimed whole brain thinking expert joined us on video conference from South Africa. Establishing values and culture: To manage the concern of derailment and excessive team storming, we focused on aligning the teams to a common set of values and culture upfront as many of the team members were coming together for the first time. This was done through a workshop especially as the participants were from different plants and were used to behaving or responding to their colleagues in a way that was different from how one would respond when working in an innovative environment. The teams worked in separate groups and mulled with tools that we gave them. For example, a powerful inquiry method pushed them to search for values in whatever acts they do on daily basis. Recalibrate’s coaches helped them anchor their learnings through Columbia Coaching process and ensured that any derailment in thinking is responded to as well. We also helped them create superior possibilities through a powerful future visualisation and neuroscience-based identity exercises. ‘I never believed anyone can map my brain’, said one of the participants after the debrief of the NBI assessment. The NBI assessment fragments the brain into four parts and eight dimensions, creating a strong learning ecosystem of how we tend to think and take decisions. It helps people equip with other people’s thinking preferences and how we can leverage each other. The Whole Brain thinking workshop included some cutting-edge concepts and building awareness around these concepts. It was a breakthrough for the cohort as they realised how easily they can activate and consciously use other dimensions of the brain to come up with ideas themselves. Once they understood that, we gave them several tools via discussions, experimentation and experiential learning to maximise their potential in the first week itself. They were also made conscious about how they could use all the eight dimensions as a team. Building an organization from scratch: The next step was to come up with how the organization they intend to build would look like and what would be the roles and responsibilities of the team. Using the knowledge of Whole Brain Thinking, the teams created the building blocks of the organization i.e. values, behaviours, culture, resources, processes & success. A case study helped them understand the 50-year journey of an organization and the ‘innovation’ that helped it make it to the Fortune 500 list for more than 10 years in a row. 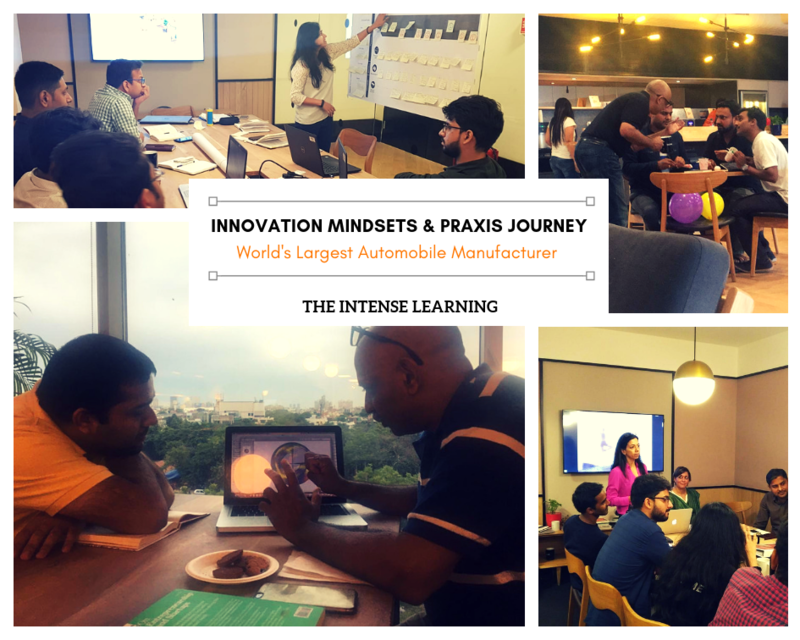 The first week was about shifting mindsets – building a culture of innovation and knowing values; moving from status quo to innovative thinking, from business thinking to innovative thinking. That gave them a foundation to now receive the cutting edge tools including many elements of design thinking and SIT methods. Innovation praxis: Two weeks involved giving them tools of ideating including design thinking and SIT. They defined their challenges using tools from MIT and Stanford, creating customer journeys and customer personas. This was, again, a breakthrough as they actually participated in real one-on-one interviews with users and stakeholders who were relevant to their respective challenges. All 11 people in the cohort came with 5 to 12 years of experience at plants and manufacturing units. The environment of the innovation journey and the new thinking styles they explored were the exact opposite of what they were accustomed to, which was one of the big pieces we had to work through. In just a week to 10 days, they observed huge mind shifts with many reporting a change in worldview. We have also co-created a plan with the management team to help them become innovation champions and integrate appropriately when(if) they go back. The activities were designed in such a way that the first half included sharing concepts in a highly creative classroom-setting, making them experience followed by the application of those concepts in the office in the second half. At the office, the teams would work alongside the faculty, who would observe them and challenge them, keeping the focus on the larger team outcomes. We used several well-established frameworks like the 5 QF framework to continue to narrow the gap between an ideal situation and what is really happening. Team Morale and Mood: Unlike workshops, the innovation journey has been very engaging as they are all hands-on working sessions. We also make sure that the teams stay above the line that we make that possible through energisation exercises, workouts and built-in creative conversations on abstract topics. The many case studies and interactions from industry experts are also key. Innovative learning methods: Innovation and creativity require a mental and physical space.Our faculty is very well versed and adept in creating such mental spaces thanks to their background in their behavioral sciences. background. We also included fun activities like PLR (past life regression)with the idea dea that curiosity is an important part of a mindset shift. It’s not about believing or disbelieving. It’s about experiencing and experimenting. Even as these topics were alien to the subjects, they were still open to them and their curiosity made huge leaps. Many of them remarked “they have turned 180 in terms of their world view, knowledge and openness in the last couple of weeks. We presented a concrete plan to the organization when we started but as we embarked on this journey nuances and other challenges started to surface. However, as our program is based on flexibility, we constantly tweak and recalculate – just like as innovators do it in a lean startup model. For example, the Entrepreneurial potential workshop was scheduled to happen in first 20 days but we shifted it right at the end as the group wasn’t there. We are confident that the momentum and foundation we have built at the halfway mark will catapult them to the next part of the journey.